This is to invite graduate students involved or interested in climate change research, or areas related thereto, to a round table discussion at the MacEachen Institute of Public Policy and Governance (MIPP) on Thursday, January 31, 2 – 4pm. 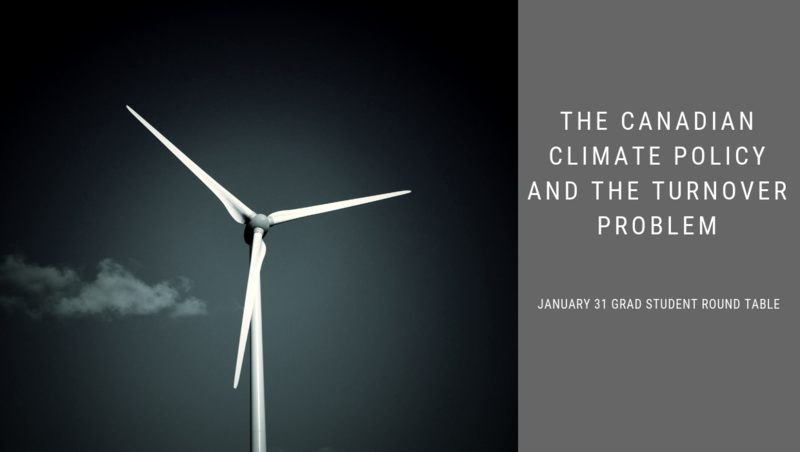 The January 31 session focuses on ‘The Canadian Climate Policy and the Turnover Problem’. The topic speaks to the historical overturning of existing policies by new regimes (both federally and provincially), as was done recently in Ontario and New Brunswick. Questions that will be engaged with include: how has the politics of Canadian climate policy been played? Is there a foundational problem with the way the policy is designed? Why have the previous and current policies ‘failed’? What are the practical and workable ways through which we can reconceive and redesign the Canadian climate policy to engender acceptance and long-term effectiveness? We are happy to have award winning historian, Dr. Jerry Bannister, as moderator at the event. We will confirm the attendance of other facilitators subsequently. Further, through this event, a cross-disciplinary platform for ‘graduate climate researchers’ to collaborate, pool ideas and resources, and engage with knotty climate change issues, will be established. We believe that this is critical to robust and effective climate change research, interventions and mobilization. Interested graduate students should please contact Warren McDougald (Warren.McDougald@dal.ca) by January 11, 2018 via email with the subject: “MIPP Graduate Researchers Climate Policy Roundtable”. The email should include graduate names, departments and areas/subjects of research. There are only a few of the 20 available seats left for the January 31 event. Interested participants will be admitted on a ‘first come, first serve’ basis, and contacted accordingly with further information on and materials for the event.